On the road crossing the island in the middle from west to east, you drive through a beautiful avenue of huge old mango trees. The creation of this avenue is linked with different tales. One tale is that a Sultan's daughter had another lover every night and whom she beheaded the morning after. The cut off heads of the unfortunate were buried along the road and out of them grew over time the mango trees. 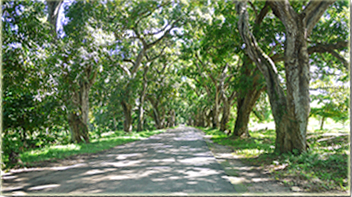 In another version, the trees were planted to commemorate the slaves who have been driven on this road across the island. You decide which story you like better! However, a side road off this avenue leads to the Bikhole Ruins, the former palace of a 19th Century Sultan's allegedly nymphomaniac daughter. In the village Kidichi a road leads to the Persian baths, which were built by Sultan Seyyid Said for his Persian wife.